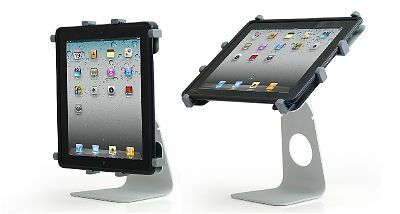 InnoPocket has just launched HexaPose UStand for Apple iPad 2/ iPad and other 10” tablets. InnoPocket HexaPose Universal Stand is made of solid aluminum with a chic design tailor-made for the iPad and other 10” tablets. It is a holder with supporting arms that grab various size tablets securely,. It comes with a rotatable pivot which can allow you to freely rotate your iPad horizontally or vertically. The pivot can also be adjusted 3 ways for different viewing angles for surfing, reading, gaming or movie viewing. It gives you more flexibility in how your tablet is displayed. HexaPose UStand is the perfect gadget for your iPad if you use iPad at home just as your PC. It makes your iPad look like a cute little Apple iMac on the desk. Founded in 1999, InnoPocket designs and manufactures a complete line of custom cases for laptop, PDA, smartphones, MP3 players and gaming devices.